Precision agriculture practices are the most effective way to significantly reduce the negative environmental impact of farming due to over-application of chemicals, while still producing enough food to satisfy a growing demand. The introduction of advanced sensing capabilities allows monitoring at plant level, spotting problems before they spread. Furthermore, introducing farming robots, chemicals can be applied with honeybee precision, pesticides and fungicides can be used only when needed and in the smallest necessary amount, or even be substituted by less impacting techniques (e.g., mechanical instead of chemical thinning, biological control instead of chemical pesticides). The adoption of such an innovative concept in vineyard farming entails the automation of many tasks, ranging from green pruning and bunch-tip thinning, to precise spraying of chemicals and water, to plant monitoring and protection using integrated biological techniques. 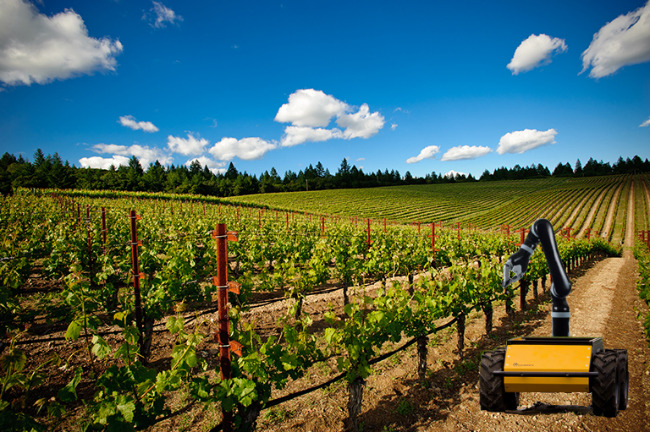 GRAPE project (Ground Robot for vineyArd monitoring and ProtEction) aims at creating the enabling technologies to allow agricultural service companies and equipment providers to develop vineyard robots that can increase the cost effectiveness of their products with respect to traditional practices. In particular, the project addresses the market of instruments for biological control by developing the tools required to execute (semi) autonomous vineyard monitoring and farming tasks with Unmanned Ground Vehicles (UGVs) and, therefore, reducing the environmental impact with respect to traditional chemical control.